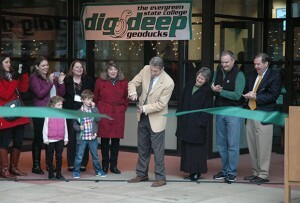 OLYMPIA, Wash. – Entering a new digital era, the Evergreen Geoducks are proud to announce the launch of www.gogeoducks.com. The site launched Thursday and will be the new home for Geoduck fans to follow their favorite teams. “Our fans and student-athletes have been asking for a more dynamic presence on the website for years and we are excited to finally be able to provide that,” said sports information director Chris Thompson. Evergreen teamed up with Sidearm Sports to design the site, which will feature new photo and video content. The site also features an easy to easy adaptive site for tablets and phones. The Geoducks are the ninth of 10 schools in the Cascade Conference to launch a site with Sidearm, who also hosts the site for the CCC. A total of 742 schools across North America currently work with Sidearm to host their athletic website. While the site is launched and ready to go for the fall, fans should check in often as new content is expected to be added on a regular basis. OLYMPIA, Wash. – On a night that honored all the achievements within The Evergreen State College Department of Recreation and Athletics, the Geoducks inducted the second class of the Recreation and Athletics Hall of Fame. Joining the inaugural class of 2012 were US Soccer paralympian Josh Blue, former men’s basketball player Troy Torbert and former men’s soccer coach Arno Zoske. A member of the 2004 U.S. Paralympic Soccer Team that competed in Athens, Greece, Josh is a 2001 graduate of The Evergreen State College. He was voted the Last Comic Standing on NBC’s reality show Last Comic Standing during its fourth season. The first All-American in Evergreen basketball history, Troy transferred to Evergreen prior to the 1997-98 season from Cornell University. In his first season with the Geoducks, he was named First Team All-Conference and Honorable Mention All-America. He remained at Evergreen as an assistant coach for the 1998-99 season, graduating that spring. The second head coach in Evergreen men’s soccer history, Arno arrived on campus following a journey that should be on the big screen. Born in 1939, his family escaped Eastern Germany and eventually immigrated to the United State in 1956. He served as athletic trainer for the University of Notre Dame basketball team under Digger Phelps before moving to Washington to start a soccer coaching career. After stints at Tacoma CC and Pacific Lutheran, he arrived at Evergreen in 1983, earning 93 wins in 12 seasons at the helm of the Geoducks. In addition to the hall of fame inductions, the Geoducks also handed out a number of awards, including Male and Female Athletes of the Year. Sophomore high jumper Anthony Johnson (Seattle, Wash./Garfield HS) was named Male Athlete of the Year after earning a pair of All-American honors. He placed fifth at the NAIA Indoor Track and Field Championships before earning a runner-up finish last week at the NAIA Outdoor Track and Field Championships. He also became the first individual Cascade Conference champion in school history, winning both the high jump and long jump at the CCC Championships in Nampa, Idaho. Senior women’s basketball player Sammi Clark (Monroe, Wash./Monroe HS) earned Female Athlete of the Year honors after earning First Team All-CCC honors. Clark led the Geoducks in scoring with 15.0 points per game and added 115 assists to her now-school record total of 290. She finished her three-year career at Evergreen with 969 points. OLYMPIA, Wash. – As part of Return to Evergreen festivities and in honor of a tenure that lasted over 20 years, The Evergreen State College officially dedicated the Costantino Recreation Center on Saturday evening in honor of retired Vice President for Student Affairs Art Costantino. On hand to help dedicate the building was Vice President for Finance and Administration John Hurley, current Vice President for Student Affairs Wendy Endress, Director of Recreation and Athletics Matt Newman, Assistant Athletic Director Monica Heuer and former student-athlete Jackie Robinson. The building, which was officially renamed the Costantino Recreation Center on June 13, 2013 by the Board of Trustees, is home to Geoduck intercollegiate athletics, wellness/recreation classes, club sports, The Outdoor Program (TOP), camps, clinics and general recreation use by student, faculty and members of the community. Costantino served as Vice President for Student Affairs from July 13, 1992 until June 30, 2013, making him the longest-serving vice president in the history of The Evergreen State College. His tenure was marked by a record of accomplishment that has transformed the student experience at Evergreen, including the expansion of intercollegiate athletics. Under his leaderships, Evergreen began men’s and women’s basketball in 1997 and women’s volleyball in 2001. OLYMPIA, Wash. – With the 2012-13 year nearly behind us, the Evergreen Geoducks took an opportunity to look back and honor extraordinary achievements at the annual Recreation and Athletics Banquet on May 30 at the CRC Gymnasium. Following a catered dinner, Evergreen Director of Recreation and Athletics Matt Newman took an opportunity to honor retiring Vice President for Student Affairs Art Costantino, presenting him with a lifetime season ticket, as well as a lifetime pass to work out at the CRC. Each of the Geoducks varsity sports, as well as aquatics, The Outdoor Program, Challenge Course and CRC Operations and Event Staff, had the opportunity to reflect on the last year and hand out awards for outstanding achievement. Evergreen Student-Athletic Advisory Committee handed out an inaugural Contributor Award, which allowed Geoduck student-athletes to recognize an individual for all their support of Evergreen athletics. The initial award went to Chris Balske, Director of Sports Medicine, for his endless support of Geoduck athletes. The Geoducks also handed out participation awards to all the student-athletes. First year varsity athletes received a felt letter while second year letter winners were awarded a Speedy Q. Geoduck pin. Third year letter winners received a scarf while five four year letter winners were awarded an embroidered blanket. Graduating seniors from across Recreation and Athletics were also honored for their academic achievement, receiving a portfolio that can be used as they enter the professional world. The final awards presented were the Student-Athlete of the Year awards, which were presented by Assistant Athletic Director Monica Heuer. Senior Danielle Swain (Rainier, Wash./Black Hills HS) was named Female Student-Athlete of the Year after a record-breaking career as a member of the women’s basketball team. Sophomore Les Jones (Tacoma, Wash./Mt. Tahoma HS) was named Male Student-Athlete of the Year after setting three school records during the indoor and outdoor track and field season. When Dr. Les Purce traveled to Kansas City last weekend for the 2013 NAIA Convention, he do so not just as President of The Evergreen State College but as the Chair of the NAIA Presidents Council. “The NAIA provides those of us who share common values with an opportunity to work together in a community with like-minded institutions that value autonomy, student-athlete welfare, character, and athletics competition as a component of our institutions’ missions to build better citizens of the world,” said Purce in his opening remarks at the convention. His term officially began on January 1 and shortly after that, NAIA President and CEO Jim Carr made the trip to Olympia and Evergreen to spend two days with Purce, as well as learn more about Evergreen and the Cascade Conference. The visit also allowed Evergreen staff to meet with Carr, who was able to share his goals as head of the NAIA. It also allowed Carr to experience the uniqueness of Evergreen and to understand the distinct challenges faced by the liberal-arts college in Olympia, Wash. He shared his vision for the future of the NAIA and allowed the Geoducks an opportunity to understand the inner-workings of the national office. The appointment of Purce to the position by his peers brings considerable pride not just to Evergreen but the Cascade Collegiate Conference as well. Joining Purce in Kansas City will be Evergreen Director of Recreation and Athletics Dr. Matt Newman. Newman, who is in his second year at Evergreen, understands the significance of having such an important role filled on campus. In addition to Purce meeting with his fellow presidents to discuss the future of the NAIA, the convention has a number of legislative proposals that will be voted upon by the membership. Among them is the creation of a national program for recognition of institutional and conference letters of intent as well as a number of amendments dealing with the eligibility process. While his term only lasts until the end of 2013, Evergreen is very proud to have President Purce in such a high profile position. “At Evergreen, we continue to appreciate his ongoing support of student-athletes, and we’re very proud that he’s chosen to take the time to serve the NAIA in this important role.” added Newman.